We're exploring the wide world of magnificent meats, traveling around the globe to uncover traditional proteins and their classic preparations, then testing modern techniques to take them from unfamiliar to new favorite. When it comes to cooking rabbit, low and slow is the go-to technique. Even though rabbit braises take less time than, say, a lamb shank, we know that slow-cooking is still slow. So Test Kitchen Manager Jade and Staff Culinarian Liv set out to shake things up. They experimented with marinating, grilling and deep-frying different rabbit cuts to find new quick & easy ways to cook rabbit. We were pleasantly surprised to learn that you can definitely, deliciously go beyond braising. Jade tackled her deep-frying experiment with three test batches to uncover the secret to this technique: boneless striploins. For deep-frying, the third time was indeed the charm: perfectly cooked through, tender and succulent with that desired crunchy coating. Striploins are somewhere between a chicken nugget and a tender in size and shape, making them the easiest to work with and the best choice for this technique. In the final test batch, Jade first quickly separated the belly flaps from the striploins. 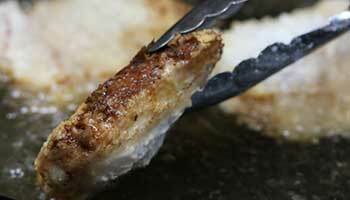 She then dredged, breaded and fried only the striploin, reserving the bellies for another use. (She thinly sliced and tossed them in a stir-fry later.) It was a delicious, crunchy, perfectly cooked success! ROUND #1: The flaps dried out in the oil, to the point of nearly burning, before the striploins were fully cooked through. "I definitely recommend removing the bellies before frying, if you're using the saddles," says Jade. "It's very easy. Or use boneless striploins to make it even easier!" 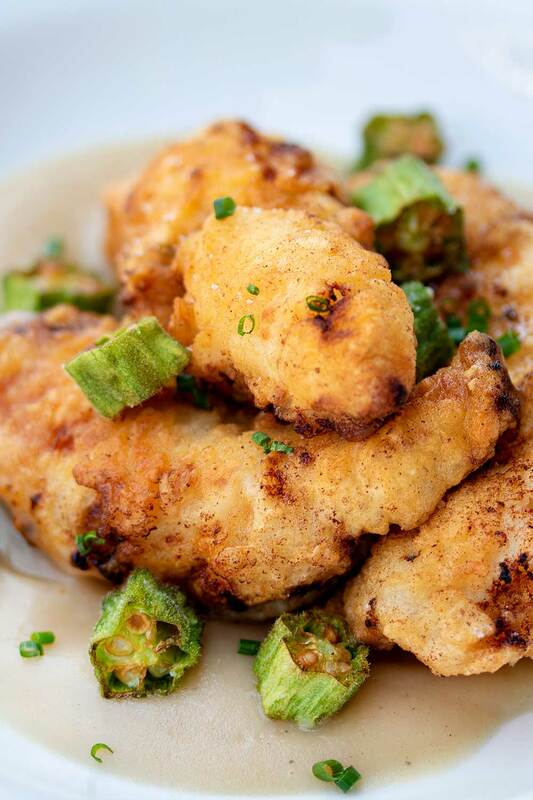 While we tested a traditional buttermilk marinade for authentic chicken-fried flavor and texture, a simple three-step dredge (flour, egg, breadcrumbs) will also do the trick since the coating will insulate the meat and protect it from the heat of the oil, ensuring juicy, tender results. 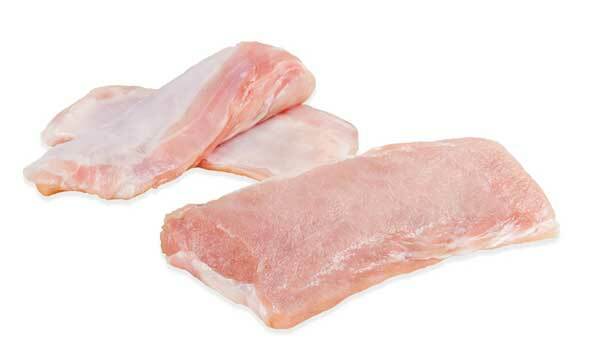 Rabbit striploins are the most tender, uniform & succulent part of the saddle – tender strips of meat that cook quickly and are perfect for salads & appetizers. If you're buying a case of boneless rabbit saddles for other recipes (like a roulade), you can absolutely use those with this deep frying technique. 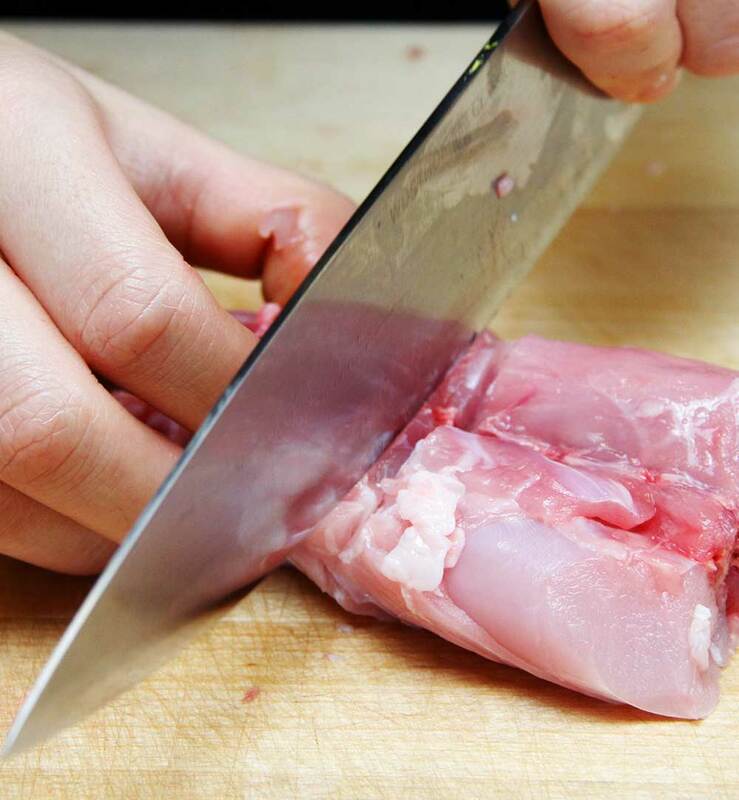 Just make sure to remove the belly flaps first, like Jade did, and reserve for another use (like in a rabbit saltimbocca —you don't even need to pound them because they're already even and thin!). 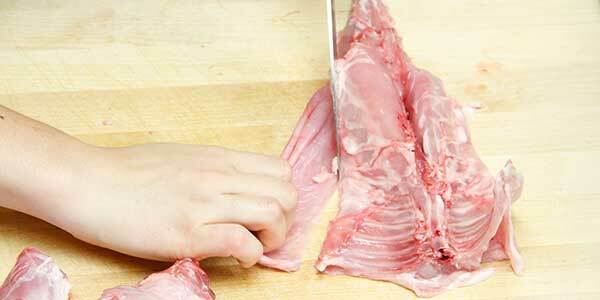 For this experiment, Liv worked with both bone-in and boneless cuts (hind legs and boneless saddles). 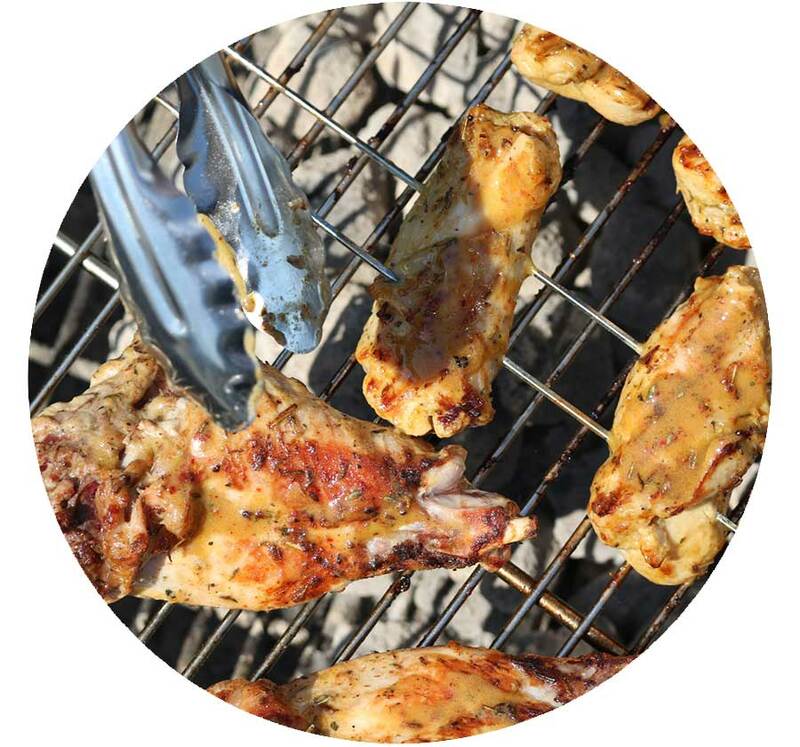 She used her go-to marinade, one of her mom's recipes. The results were tender and flavorful. The saddles were succulent, and the legs were infused with great grill flavor. The leg meat was a little bit less tender and more dry than the saddles, but it was still delicious (and all pieces were quickly devoured by the rest of the Marx Foods team!). Liv wrapped the bellies around the striploins and threaded the whole saddles on skewers (this makes them much easier to flip on the grill). Unlike Jade's belly flap frying flop, the bellies didn't dry out on the grill and helped to keep the saddles tender and succulent. "Wrapping the bellies around the striploin actually helped to insulate it," says Jade. "I think rolling up the whole piece with the belly on the outside actually worked really well," Liv agreed. "It kind of barded itself." Set up a zone system and bank your coals on one side, giving you a cooler space to move pieces away from direct heat and prevent overcooking. Bring the pieces to room temperature first. Don't let 'em sit. 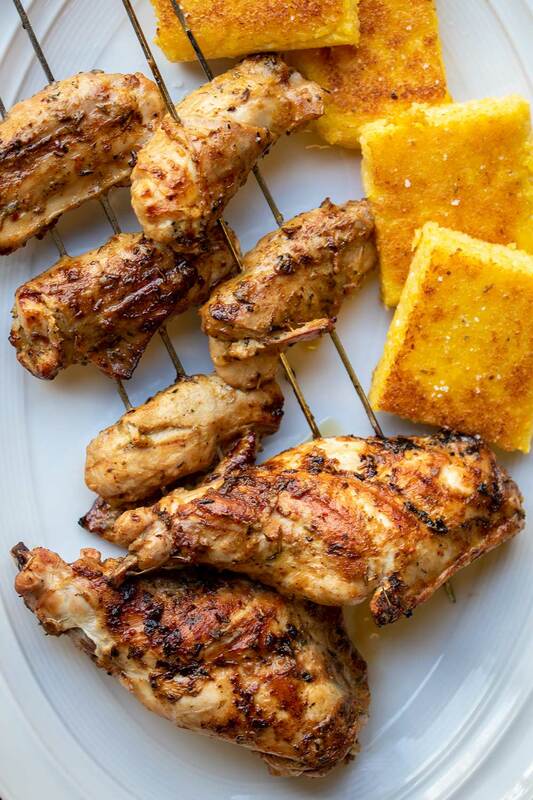 "I kept the pieces moving, instead of only flipping once, and basted with marinade at every flip to ensure they stayed moist and didn't get overcooked," says Liv. "The boneless saddles were a great choice for high heat cooking!" said Jade. "Before the test kitchen, I always associated rabbit with low-and-slow cooking methods. When we first pitched grilled rabbit, I was skeptical because it is so lean and notorious for getting dry and tough. This worked really well."